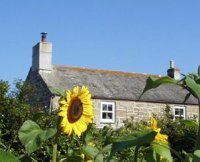 Our lovely 200 year old farmhouse is nestled in a valley 2 miles north of Penzance. It's a working smallholding with horses, chickens and a small herd of Belted Galloway cattle. The comfortable ground floor guest room looks onto a pretty garden and has a very comfortable double bed, en suite wet-room, Sky flat screen TV and a DVD player with a selection of films. Breakfast is continental style and includes, tea, coffee and a selection from delicious Cornish cheeses, cold meats, hardboiled eggs, (freshly laid by our own hens) and of course homemade bread. Just what you need before a full days' exploring! Oh and what you don't finish, you're welcome to take as a lunch box. With stunning local views, traditional Inns and some of the best beaches in the country right on your doorstep, we're sure you'll enjoy every minute of your day.